Ford Fusion Pros and Cons | Page 1 of 5 | Why Not This Car? What drives people to buy (or not buy) a certain car? TrueDelta's members share Ford Fusion pros and cons based on their real-world driving experiences. I've Never Had A Car Fail So Spectacularly. We really got to love this Fusion! Traded my sports car (2014 Mustang GT, base) for a 1'4 Fusion Titanium (2.0L 1-4 Ecoboost, FWD) because I needed something familiar (i.e. Ford) with better technology, fuel economy, and comfortable seating for 4-5. 2015 Ford Fusion Hybrid, 5,000 miles per month. Solid car, excellent gas mileage, cramped trunk (batteries), drives like any other midsize. This time Ford got it right. I would rate this car 9 out of 10 and a best buy. 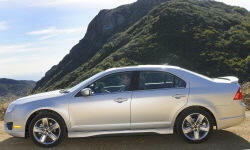 It's easy to option a midsize sedan over, even well over, $30,000. But what can you get for, say, $21,785? Earlier I reviewed the top-level 2014 Mazda6 Grand Touring. How much do you give up with the base car? Ford cars have really come a long way! More Americans need to check out the new 2013 Fusion. I bought this car after renting one in MA and truly loving it right away with its quietness, road isolation, comfort, fuel economy (4 cyl), and predictable handling in icy conditions. Its huge trunk definitely was a sweet bonus as well. We test drove both the Fusion Hybrid and the Camry Hybrid and found that Ford has pushed the Fusion leaps & bounds ahead of the Camry now. Over 40 MPG in the city.